Eisendrath House is a historic house venue which was restored by the Rio Salado Foundation and the City of Tempe. The venue is available for Weddings, Special Events and Meetings. The house and grounds include a walled courtyard with chocolate flagstone and the original fountain. 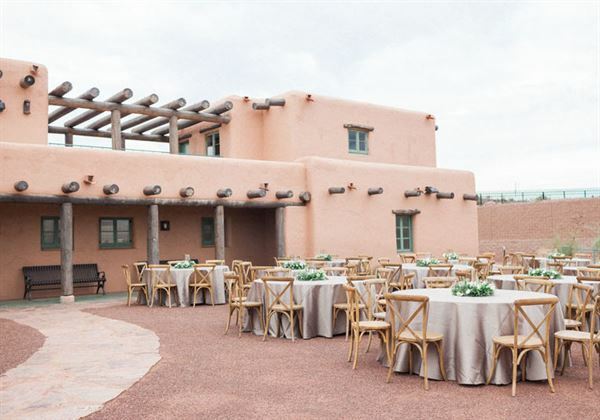 Three important outdoor entertaining terraces and a second-floor open-air dining or reception veranda are part of this unique small special event venue, available to rent for your event. The Great Room can entertain approximately 80 people seated. The home is a unique setting with a historic flair for receptions and events. Corporate meetings or retreats, private dinner parties, a wedding or an anniversary celebration are just a few examples. The entire house and grounds can accommodate a group of around 300 throughout the many entertainment spaces. Public access spaces include a Great Room with a fireplace, a dining room, three gallery rooms with interpretive displays and period furniture, the outdoor East Terrace and North Terrace, the Flagstone Patio with Fountain, the 2nd Floor Breezeway/Terrace with a weight capacity of 60 people. Docent led tours are available on Thursdays and Saturdays from 10am - 3pm by appointment only.